FILE - President Donald Trump tours the American Center of Mobility, March 15, 2017, in Ypsilanti Township, Mich. From left are EPA administrator Scott Pruitt, Michigan Gov. 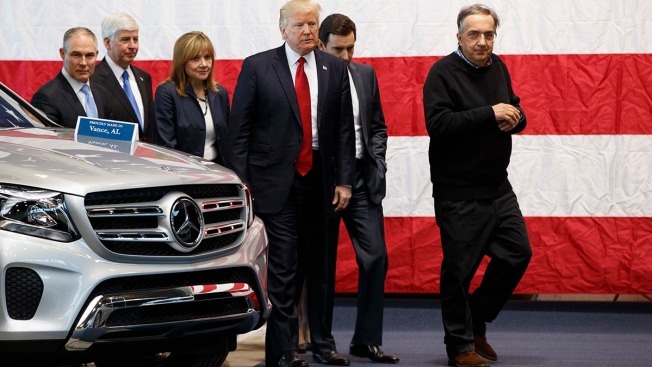 Rick Snyder, GM CEO Mary Barra, Trump, Ford CEO Mark Fields, and Fiat Chrysler CEO Sergio Marchionne. The U.S. automotive industry has largely embraced the benefits of the North American Free Trade Agreement since it went into effect Jan. 1, 1994, which may explain why auto and parts makers have become some of the fiercest and most vocal opponents of the Trump administration’s plan to renegotiate, or even demolish, NAFTA. As NBC News reported, then-candidate Donald Trump turned American manufacturing jobs into a cornerstone of his presidential campaign and even attacked Ford over its plans to shift production of small passenger cars, such as the Focus, from the U.S. to Mexico. Early on, the auto industry took a cautious approach, attempting to highlight the benefits of the three-nation pact, while trying not to directly challenge the new president. But over the past several months, as the trade talks have generated more friction than results, and as Trump has weighed in by threatening to scuttle NAFTA entirely, the auto industry has begun to raise its collective voice, creating a growing rift with the White House.